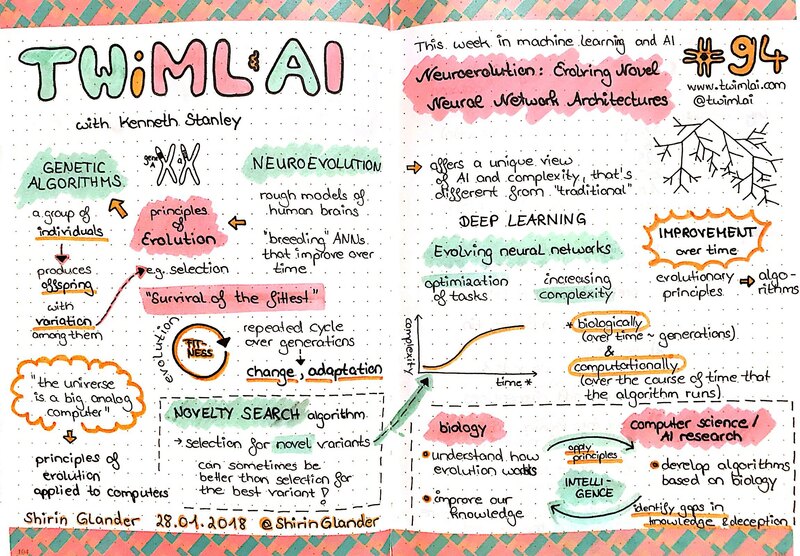 These are my sketchnotes for Sam Charrington’s podcast This Week in Machine Learning and AI about Neuroevolution: Evolving Novel Neural Network Architectures with Kenneth Stanley: Sketchnotes from TWiMLAI talk #94: Neuroevolution: Evolving Novel Neural Network Architectures with Kenneth Stanley You can listen to the podcast here. 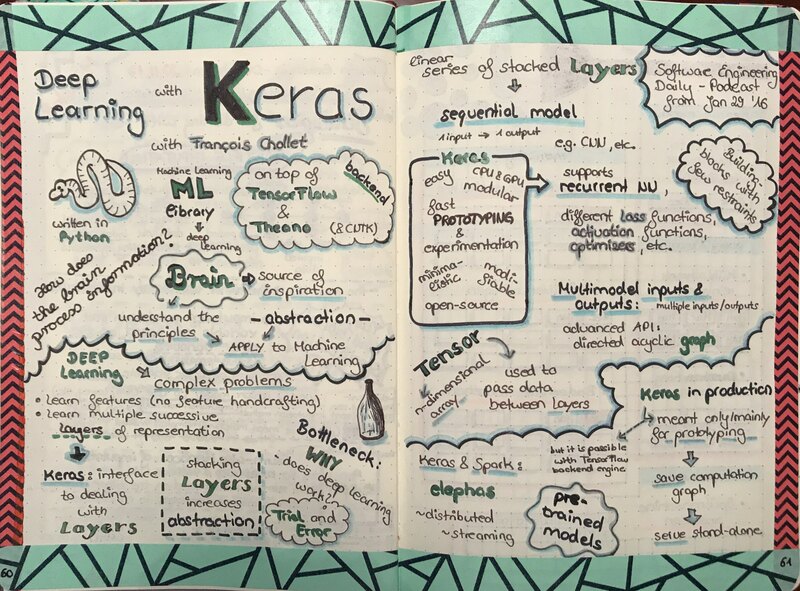 Kenneth studied under TWiML Talk #47 guest Risto Miikkulainen at UT Austin, and joined Uber AI Labs after Geometric Intelligence , the company he co-founded with Gary Marcus and others, was acquired in late 2016. 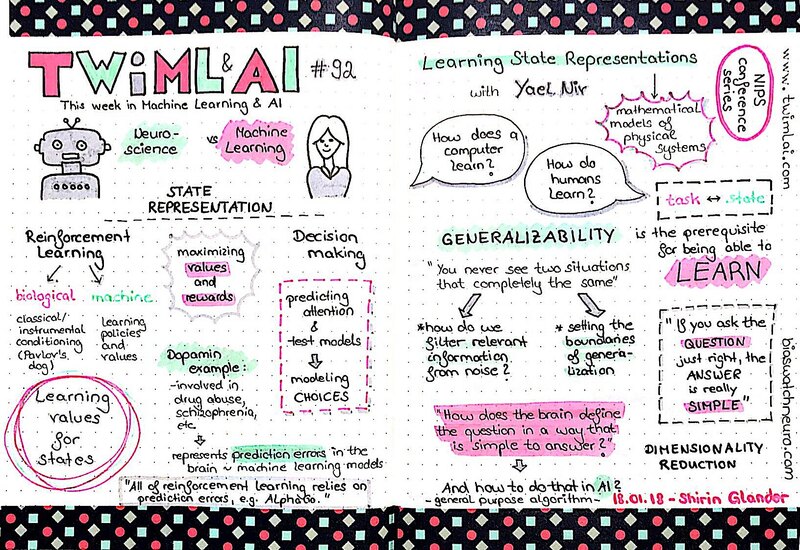 These are my sketchnotes for Sam Charrington’s podcast This Week in Machine Learning and AI about Learning State Representations with Yael Niv: https://twimlai.com/twiml-talk-92-learning-state-representations-yael-niv/ Sketchnotes from TWiMLAI talk #92: Learning State Representations with Yael Niv You can listen to the podcast here. In this interview Yael and I explore the relationship between neuroscience and machine learning. In particular, we discusses the importance of state representations in human learning, some of her experimental results in this area, and how a better understanding of representation learning can lead to insights into machine learning problems such as reinforcement and transfer learning. 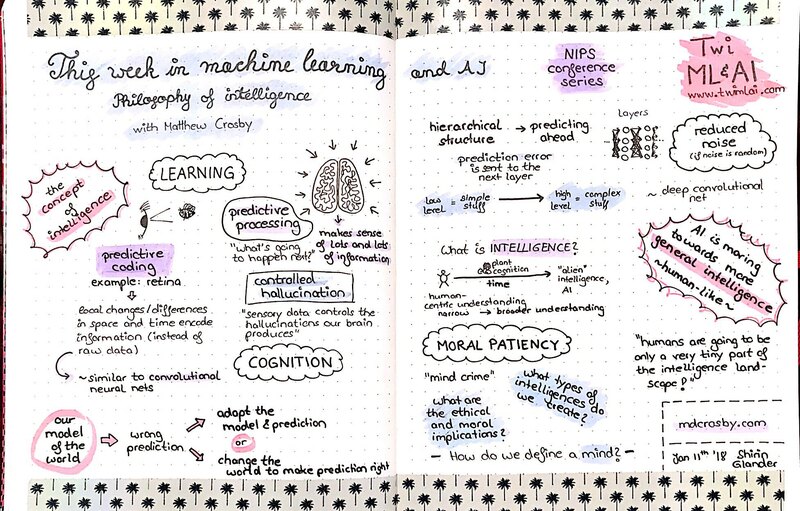 These are my sketchnotes for Sam Charrington’s podcast This Week in Machine Learning and AI about Philosophy of Intelligence with Matthew Crosby: https://twimlai.com/twiml-talk-92-learning-state-representations-yael-niv/ Sketchnotes from TWiMLAI talk #92: Philosophy of Intelligence with Matthew Crosby You can listen to the podcast here. This week on the podcast we’re featuring a series of conversations from the NIPs conference in Long Beach, California. 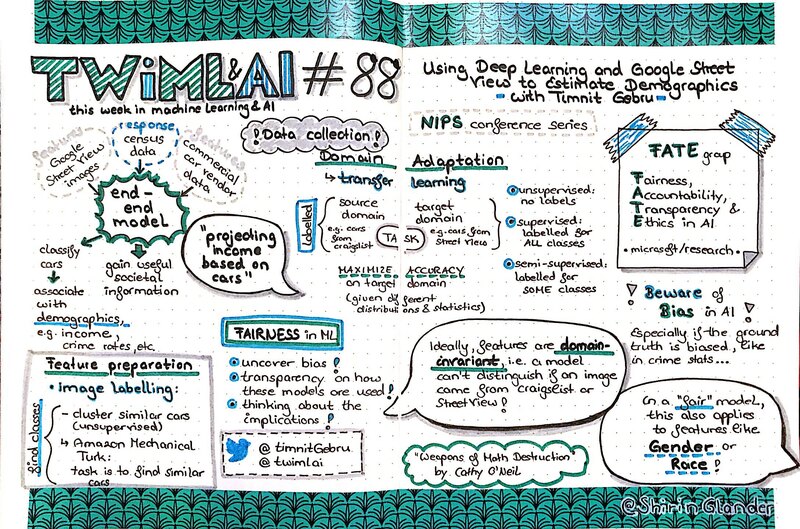 I attended a bunch of talks and learned a ton, organized an impromptu roundtable on Building AI Products, and met a bunch of great people, including some former TWiML Talk guests. 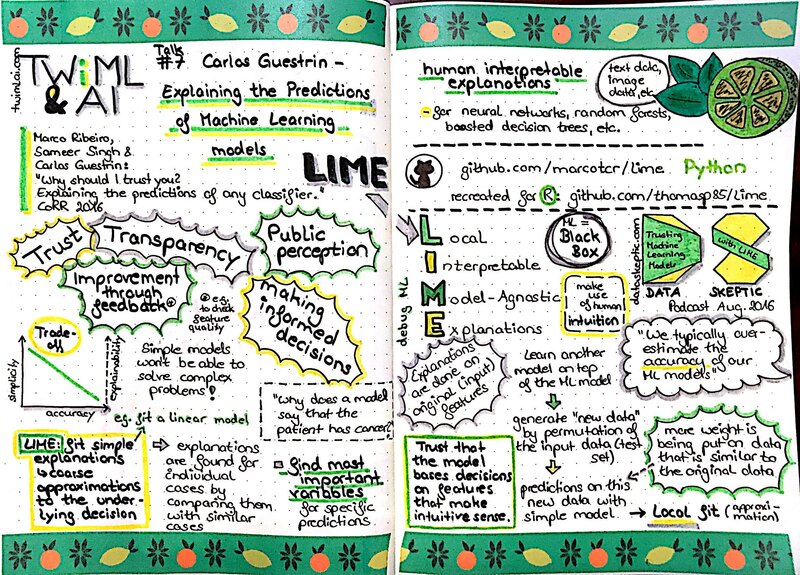 Slides from Münster Data Science Meetup These are my slides from the Münster Data Science Meetup on December 12th, 2017. knitr::include_url("https://shiring.github.io/netlify_images/lime_meetup_slides_wvsh6s.pdf") My sketchnotes were collected from these two podcasts: https://twimlai.com/twiml-talk-7-carlos-guestrin-explaining-predictions-machine-learning-models/ https://dataskeptic.com/blog/episodes/2016/trusting-machine-learning-models-with-lime Sketchnotes: TWiML Talk #7 with Carlos Guestrin – Explaining the Predictions of Machine Learning Models & Data Skeptic Podcast - Trusting Machine Learning Models with Lime Example Code the following libraries were loaded: library(tidyverse) # for tidy data analysis library(farff) # for reading arff file library(missForest) # for imputing missing values library(dummies) # for creating dummy variables library(caret) # for modeling library(lime) # for explaining predictions Data The Chronic Kidney Disease dataset was downloaded from UC Irvine’s Machine Learning repository: http://archive.